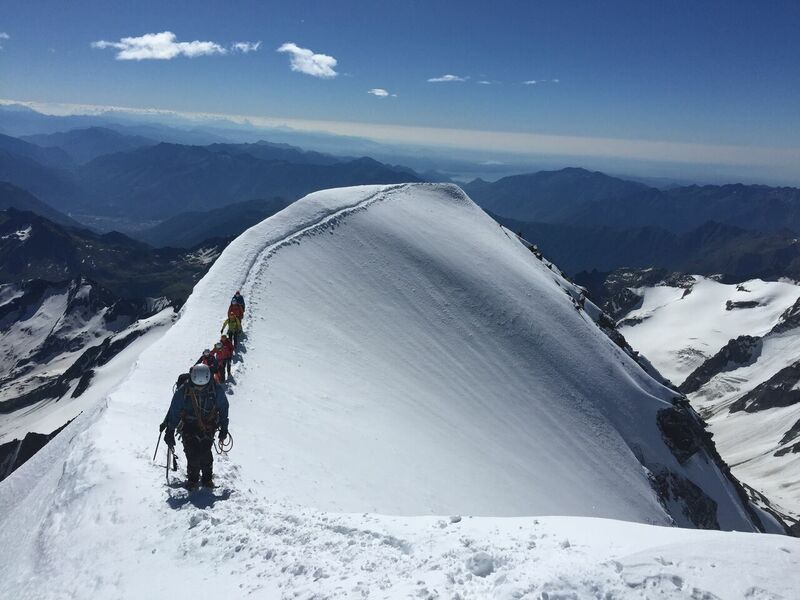 Mont Blanc 17th – 24th June 2016. Well after completing the 360 Expeditions Mountain Skills Course in February this year when we almost got to the summit of Pico Aneto but had to turn back due to the weather conditions, I just had to go on another trip. Because the Mountain Skills Course was so good I decided to go for Mont Blanc with 360 and to say I wasn’t disappointed is a gross understatement; it was excellent. 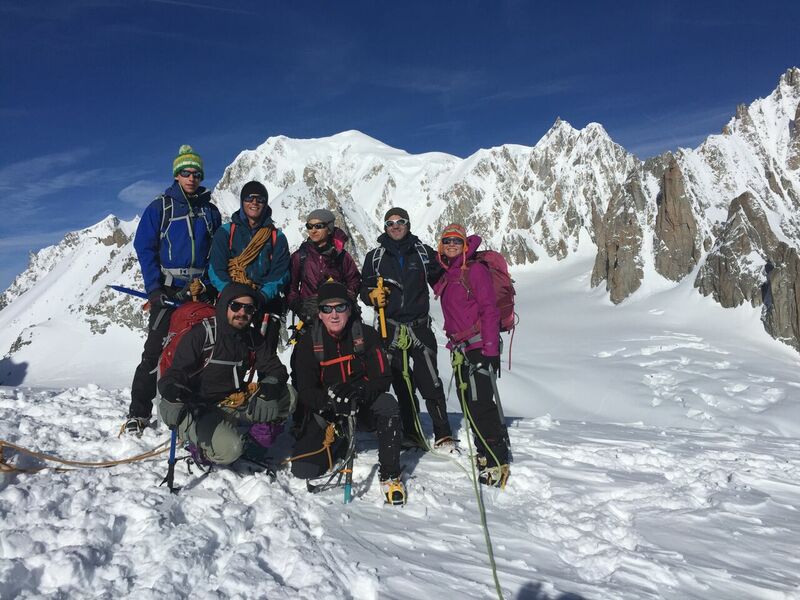 We started with three days of acclimatization and practice on the Italian side of Mont Blanc reached via the Mont Blanc Tunnel and the space age gondola, Skyway, to the Rifugio Torino. It wasn’t long before our guide Stuart Macdonald had us in our gear for the glacier and outside strapping on crampons for a nice little walk across the glacier around the base of the Petit Flambeau. It looked flat – it wasn’t. The day turned out to be more strenuous than anticipated and I ended up with severe cramp in both legs that night. I was seen in the dormitory hopping about to stretch it out and one of the team, Reza, kindly ran off to the bar to get some tonic water to alleviate the problem. Meanwhile the weather pattern was for sunshine in the mornings with cloud and wind gathering by lunchtime then more snow during the afternoon and evening. Our guides commented that they had never seen this much snow on the mountain at this time of the year. Spectacularly beautiful in the sunshine but bringing with it the increased risk of avalanche or concealed crevasses. With our acclimatization completed we returned to the comfort, no, sheer luxury of Black Rock Ski Lodge, making full use of the hot tub in the garden with stunning views – scenery, not the team! Next up, Mont Blanc. With a fairly leisurely start on the Tuesday we took the gondola and Mont Blanc Tramway to the end of the line at Le Nid d’Aigle 2372m. From here it was a hike on the rocky path then crampons across the snow for the final stretch. Unfotunately, the fine weather deserted us, the clouds came in with rain and drizzle making the last section up to the Téte Rousse hut at 3063m a little like “boil in the bag” with the waterproofs on. With the summit chance down to 50-50 due to the change in the weather we went for an early night with fingers crossed for clearing skies. One of our team, Pablo, assured us that his father was praying for us and by 3.00 am we had clear skies, a full moon and a suitable drop in temperature to firm everything up for an early start. 5.00am saw us outside strapping on crampons for a long and hopefully successful day. Now Stuart, John and Kenny were happy with the weather. First obstacle, le Grand Couloir, renowned for summer rock falls, was crossed with no problems, then straight up (well it felt like it) to the Gouter Hut at 3817m, very modern, space age, hanging over the edge of a huge drop. Now only 1000m of climb to go! Mind you it was full of false summits and cries of “are we there yet”. Imagine the surprise as we came over one snow crest to see a bright orange Breitling plane parked neatly on the snow with the occupants enjoying the sunshine. Then on past the Refuge Bivouac Vallot at 4382m with less than 500m of climbing to go. Meanwhile, Pablo’s dad is doing a grand job, so much so I’m stripped down to a thin T-shirt and merino top, trousers of course, for the final push. Our little group of three, John our guide, Matt the farmer, whose legs are far to long, and me, reached the summit sometime around midday and we had the summit to ourselves. For some strange reason we found a small bunch of hay on the snow right at the summit. Predictably, Matt gave it a good sniff and declared it to be rather good. The views under a clear sunny sky were spectacular. As the rest of the team joined there were hugs a few tears and a great deal of satisfaction. Under the watchful eye of Stuart, John and Kenny we had all made it to the summit. 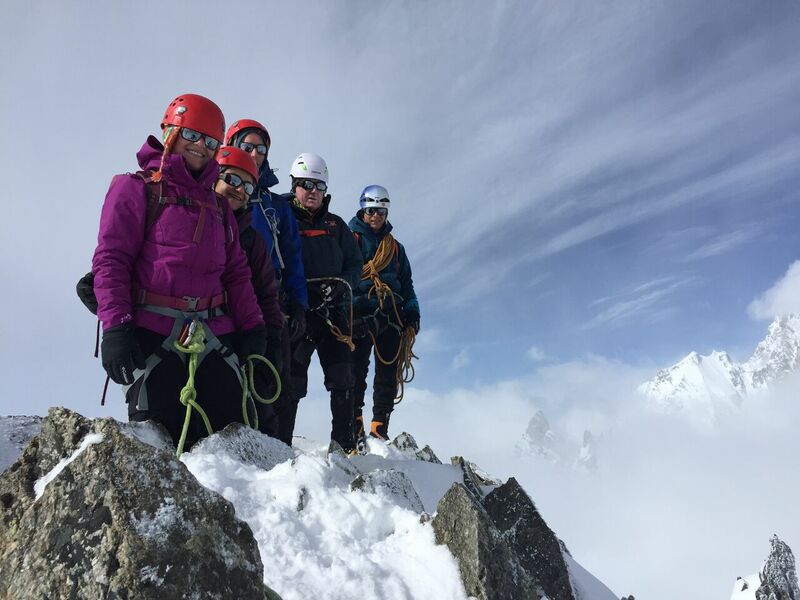 There was only one tinge of sadness when Stuart informed us that a climbing colleague had been lost two days earlier in an avalanche and in true climbing spirit they toasted him from the summit of Mont Blanc. All we had to do now was get safely back to Chamonix! The descent was straightforward, but hard work. We retraced our route back to the Gouter Hut for an overnight stay. My thighs were screaming for a rest on the way down. No sympathy from the others as I think they were the same. 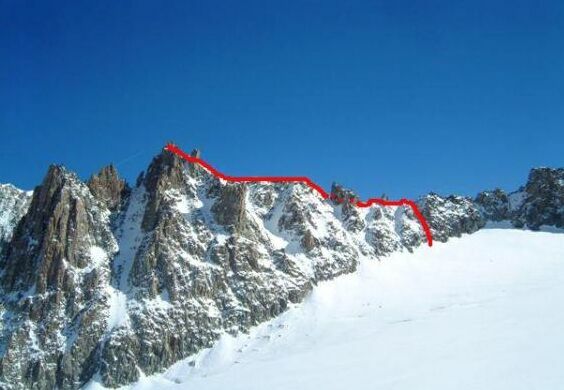 Next morning, another early start in order to reach the Téte Rousse hut, crossing le Grand Couloir before the sun hit it, thus reducing the risk from gravity affected objects. Interesting, as we crossed we noticed a large boulder that hadn’t been there on the way up. Now for something new, crampons off and a spot of glissading. It’s like tobogganing without the toboggan!! Good fun and better than walking. Mind you, John went so quickly be managed to scorch the seat of his pants. How do you do that on snow!! Quite slushy on the way down and with the glissading wet snow tends to get in where you don’t want it, but we soon dried out. Celebration fish and chips and burgers at the bottom of the cable car were very welcome. Then of to the Black Rock Ski Lodge for a proper shower and home comforts. And finally, thanks to 360 Expeditions for putting the whole trip together in such an easy to follow way. Thanks to Stuart, John and Kenny our guides for looking after us, getting all of us to the summit and for all the information and sense of humour. Thanks to Lizzie and Paul for a very relaxed and friendly stay at Black Rock Ski Lodge. (wish I’d brought a bike with me!!) Last but by no means least, The Team members who were such good company. Who could have predicted such an eclectic mix of nationalities and backgrounds, such mutual support, brilliant? Now I keep being asked, “what next?” Well, I think I’ll enjoy Mont Blanc a little while longer, then maybe? ?